Last year was such a busy year filled with drama and love. The events were so overwhelming that I forgot to take time to look around, to see the great things that have happened and are happening around me. As human beings, when an unfortunate event occurs we are either inclined to feel emotions such as fear, anger and grief or gratitude, forgiveness and love. And to be honest, I, myself rarely lean towards the latter. Furthermore personally, memories and moments of sadness and lost, seems to come very easy and vividly. While the joyful memories can be hard to dig up at times, especially when life is covered with misery and engulf by problems. Therefore, this year I want to do something different, to create something that can help me to become more grateful and draw me back to the right emotions during moments of despair. After constant browsing through the internet, I stumbled upon an Instagram photo which is this one (http://instagram.com/p/xRgdwdrajE/?modal=true). I thought to myself, “that’s not a bad idea after all”, though its a bit girly, but hey who cares its for the good in the end. Thus during the week, the search for the lucky jar begun…. This jar was slightly dull, so I decided to put on my artistic mask and give the jar a bit of a makeover. Alongside with my weapons of art, the transformation began. With sticky notes and permanent markers, I decorated the jar. 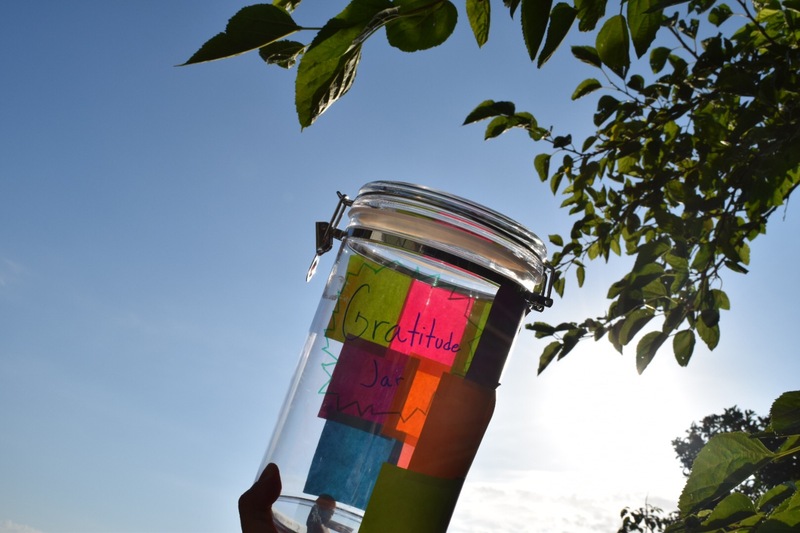 The main idea was to cover half of the jar with sticky notes that will contain wise and encouraging quotes, to serve as a reminder and inspiration to myself and for anyone who grabs ahold of the jar. And boom the jar of gratitude is born. It may not be the fanciest or the prettiest jar despite that, it was made with sincerity and purpose. I wish to fill this jar with moments, experiences, memories, achievements and whatever life decides to give me. May it be in the form of notes, objects, or pictures. I am indeed looking forward to the road ahead of me and the daily adventures that I will encounter throughout the year. Because I know every single event or problems will be memorable and something to be grateful for. I guess that concludes everything, thank you once again for dropping by. If you done something similar or anything out of the ordinary this year so far, please comment the link below. I would love to read them and be inspired :). Thank you, fellow bloggers. I hope that you are all having an astounding start of the year so far. And as always feedback and comments are always welcome. Love you all, I would like to end the post with this message and quote. With time and life passing by at such an unexpected rate, how much time or minutes do we spend daily to stop and thank the fact that we are alive and breathing at this moment? The gratitude jar reminds me of a jar of mine which is filled with paper cranes which I created in the final year of high school. Each crane contained a story and memory from some of my fellow students. I personally don’t have a jar but I use a diary, easier to carry with me around the world. I hope you are able to filled your jar with awesome memories and stories too. Paper cranes, that’s awesome, thanks for sharing Norman. I hope your diary is gradually filling up with memories and moments. Keep inspiring people around you and the world! That is great! I have an obsession with quotes, they sometimes just appear at the right time and keep you going. Keep it up, stay positive. P.s I have an image that your wall is full of posted notes hahaha! I accidentally pressed “send” too early but yeah, as I was saying. Btw nice blog, I just followed you. Looking forward to your recipes. I have a sweet tooth, and hoping to learn to bake soon :).